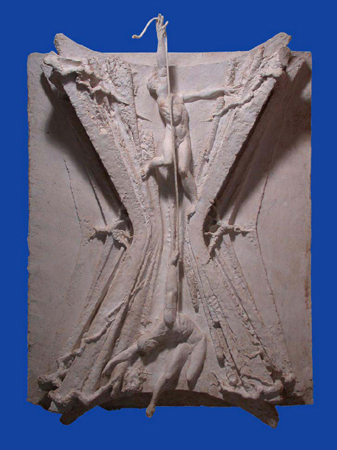 2001, Plaster (to be cast into bronze), 39"x 54" high. This work depicts two figures who are caught between the crushing walls of collapsing structures, one climber attempting to pull a fallen comrade up out of the crevasse while reaching for aid from the outside world. This concept evokes the September 11 attempt to save the victims of the tragic collapse of the Twin World Trade Center Towers. Copyright � 1998 - 1999 Sculptureworks, Inc. All rights reserved.